The pulp & paper manufacturing is a grossly polluting industry. The industry not only has been long known to consume huge amount of water but also contribute to the pollution of rivers to a large extent. However, the industry is striving to make its manufacturing process sustainable. From addressing the problem of black liquor discharge to reducing its specific water consumption, the industry has come a long way. Stringent policy for making the sector sustainable has been backed by the willingness of the industry to reduce its water footprint. However, with the rising pollution levels and ever declining water reserves, a lot is yet to be done. The pulp & paper industry in India is still not comparable to the global best in terms of specific water consumption and in such a setting, the Charter for Water Recycling & Pollution Prevention in Pulp & Paper Industries is a big step forward. Though the industry is sceptical about achieving the norms, they are ready to toe the line. Hence, the sector is expected to metamorphose and step up to the growing demand for sustainable industrial production in the country. From the beginning of economic reform in the country, the pulp & paper sector has been high on the priority list for industrial growth in India. The industry has grown tremendously, ever since the Indian government way back in the 1990s decided to delicense the industry. The potential danger this growth may have for our water resources is evident from the fact that almost 28TPD of 36TPD BOD load into Ramganga (tributary of river Ganga) is from the pulp & paper mills in Uttar Pradesh and Uttarakhand. - Senior Executive from Shreyans Industries Ltd.
Holding synergy with the growing requirement for the industry to shift towards sustainability, Ministry of Environment, Forest and Climate Change had introduced the ‘Corporate Responsibility for Environment Protection (CREP)’ which had some key action points such as installation of lime kiln for recalcination of lime sludge, utilization of treated effluent wherever possible, reduce wastewater discharge to less than 140m3/tonne of paper by 2005, etc. Following the positive outcome of CREP, CPCB came out with ‘Charter for Water Recycling & Pollution Prevention in Pulp & Paper Industries’ (WRPP) in 2015, specifically for the Ganga river basin states (Uttar Pradesh, Uttarakhand, Haryana, NCT of Delhi, Madhya Pradesh, Chhattisgarh, Bihar, Jharkhand, and West Bengal). The charter not only highlighted the Best Available Techniques (BAT) based on European Union’s BREF document, but also laid down stringent water consumption, effluent generation and effluent characteristics norms for the industry to be achieved in two phases, i.e. short term goal (by March 2016) and long term goal (by March 2017). The basic premise for abatement of pollution under the charter is based on participatory approach, which includes marking of processes and cleaner production, process standardization and technological up-gradation, end of the pipe treatment up to tertiary treatment with options of recycling. The norms thus established under the charter are very stringent and there are strong apprehensions associated. Notes: 1. Long Term norms for March 2017 will be reviewed after 18 months. The norms fixed by the Central Pollution Control Board for Indian mills are comparable to that set by the European Union (BREF). 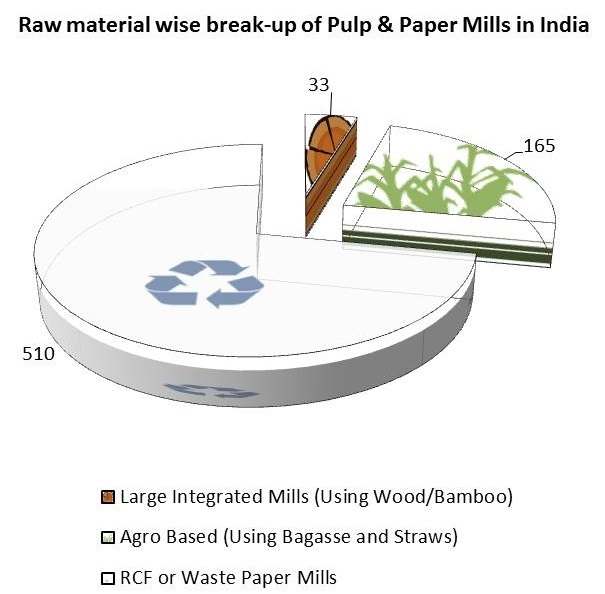 However, there are some key differences in the pulp and paper sector in both the regions which make these norms challenging for the Indian mills. The average plant size in India is around 50-60 MT, while that of its global peers are 500-600 MT. EU norms focus on specific operations and not mills as a whole and hence not necessarily would fit in the Indian context according to the industry. Moreover, the norms have not been considered in the light of cross media effect and there is un-clarity on how compliance would be tracked. 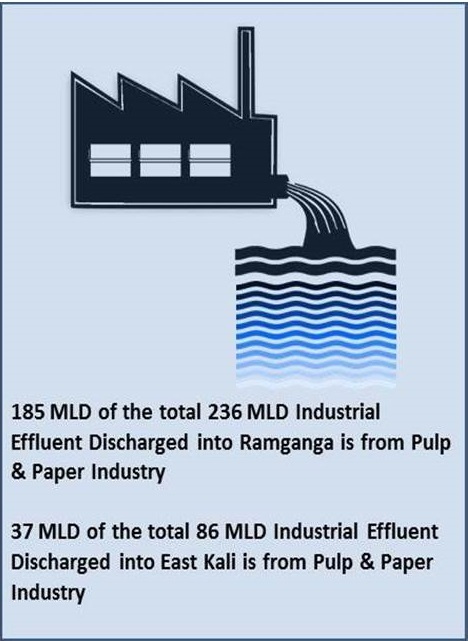 As per the charter, the pulp & paper mills have been asked to achieve zero effluent discharge into recipient streams and to use the treated effluent for irrigation purposes. In order to meet the target of complete usage of treated effluent on land would require almost 640 acres of land for a 300TPD unit during summer, this land requirement would increase manifold during winters. Moreover, availability of cultivated land around the mill, constraint in laying pipelines, no demand for effluent water during monsoons are also factors which make achieving zero effluent discharge into water body unfeasible as per the industry. With the national mandate in the pipeline, the industry is unsure as to how, achieving the norms such as that of the TDS level is possible in the real scenario especially for units using feed water which already has high TDS levels. Moreover, achieving the standard for colour is difficult as per the industry, especially for the mills producing coloured paper. The concerns of the industry have been put forth and CPCB has agreed to cater to the apprehensions. The national charter is not out yet, however it is expected that the nationwide charter is likely relax the norm for, TDS to 2100mg/l from 1800 mg/l, Colour to 350 PCU and AOX to 10 mg/l from 8 mg/l. The targets set for the industry are indeed stringent but not impossible. Infact, almost all mills in Uttar Pradesh and Uttarakhand have achieved the short term goals set by the Charter for Water Recycling & Pollution Prevention in Pulp & Paper Industries. Also, about 8 RCF based craft paper mills have claimed Zero Liquid Discharge and upgraded their manufacturing processes and Effluent treatment technologies by commissioning technologies like fibre recovery system, chemical sludge handling system, advance anaerobic bio-methanation system, tertiary treatment system, etc. The Indian pulp & paper industry has seen a sea change over the last few decades. The industry has seen a diminution in specific water consumption to about 70-80 m3/MT of product produced, however it is well below the global best scenario and European standards. 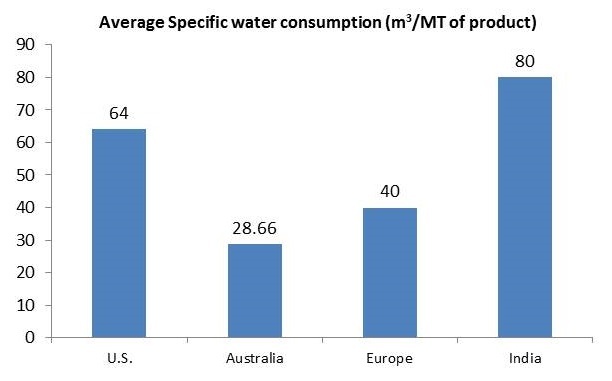 The specific water consumption of different regions of the world can be seen in the figure below. The charter categorically aims at making the industry efficient in water usage which would eventually have a long term mammoth impact. There has been a marked reduction of in fresh water consumption and effluent generation to nearly 45-50% in comparison to the pollution levels estimated in 2012, in spite of increased production capacity. It is hence expected after the entire industry comes under the ambit of the charter; a reasonable push for the industry towards sustainable manufacturing would be seen. Ansari, P.M. 2006. Key note address on corporate responsibility for environment protection (CREP) in pulp and paper industries. IPPTA J. 18: 41-45.